Well New York, you’ve done it. 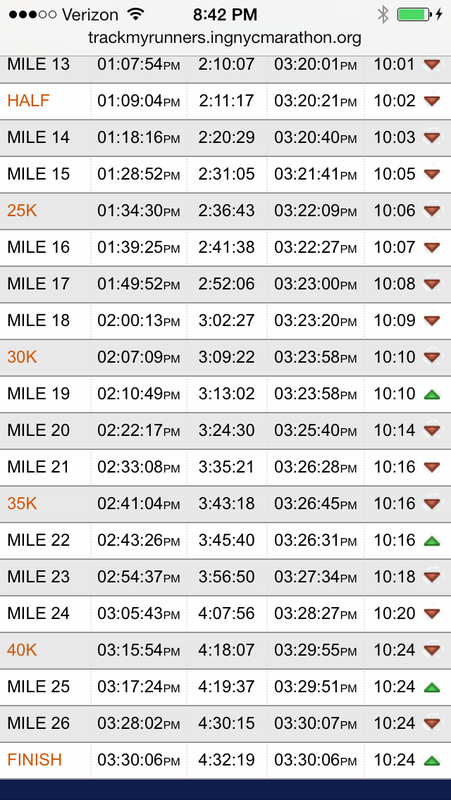 New York Road Runners has impressed me beyond my imagination. To this day my favorite race has been the Peachtree Road Race. The Atlanta Track Club is incredible. With 55,000 runners each Fourth of July the race is perfectly organized, logistics are exceptional, and fan support is so much fun and always there! 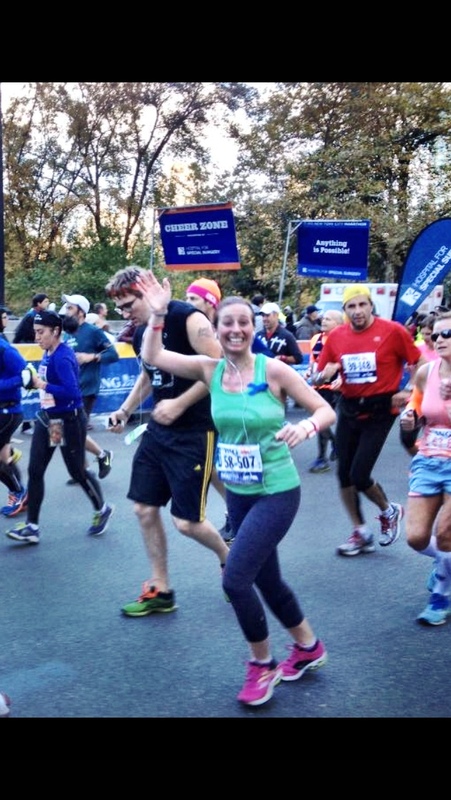 On Sunday, November 3rd the New York Road Runners put on a MARATHON in NEW YORK CITY hosting over 50,000 runners (biggest ever) from all over the world, nearly 2,000,000 spectators, and it was PERFECT. I get chills and teary eyes thinking of it. The whole city was so magical and joined together at a time when the biggest marathon in the United States needed so badly to be perfect, to bring calmness to runners around the world, and to allow so many runners who never made it to Staten Island last November or to Boylston Street in April to finally finish their race. Pre-race: I love to meet people. This may be why I love running. Waiting for the train I met two marathon runners. One who had done an Ironman only two months ago in Canada, and one who was running his 53rd marathon! We waited and waited for the train and as we were hoping to get on the 7:15am ferry we finally decided to take a cab. The sun was up and the only people out were marathoners. So many people squeezing into the Staten Island Ferry building and then squeezing through the doors onto the ferry. As I waited to meet my friends the clock ticked by minute after minute so quickly. The clock said 7:03am and I swear it wasn’t two minutes later it was 7:12am. Finally around 7:20 Leticia found me and reunited me with all of the girls. 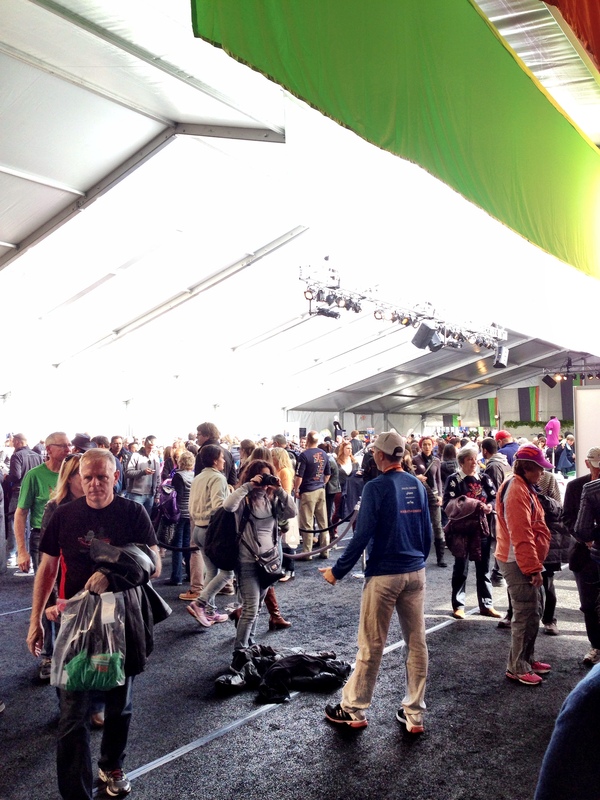 We made it to Staten Island, onto the buses, and a little after 9am we were in the starters village! I found a bagel and had half of it with my banana and Justin’s Maple almond butter packet. Perfect breakfast! All of the sudden it was 10:15 (seriously the time FLEW by all day) and they had us line up in the corrals. I took off my fleece pajama pants and kept on my hoodie since the wind was fierce! 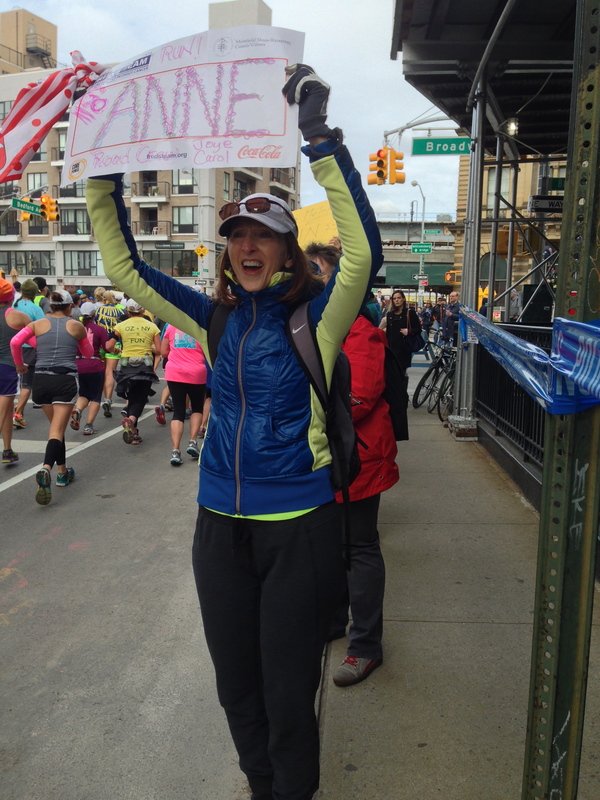 Mile 9-14: Emily told me she’d be in Brooklyn watching me and I couldn’t remember if she said mile 5 or mile 8. Once I fell into my groove I knew I’d see mom and Carol at mile 10.5 so I was cruising down the road. Somehow I spotted Emily and yelled “Em Em Em! !” but she never heard me! About a mile later I spotted mom and Carol (see below) and it was so exciting! It gives me so much energy to see my fans! As I approached mile 14 I saw a bridge and thought it was the 59th Street bridge, “It must be two miles long!” I thought. Nope, it was the Pulaski Bridge. I had run this bridge before but along the sidewalk so it looked totally different. It was slightly steep but I pushed up it and made it into Queens. Mile 1-13 splits were incredibly consistent, especially considering I wasn’t wearing a watch and had no idea what time I started according to the clock. I saw a clock at mile one and so each mile I crossed hoped it would be 9-10 minutes added. I started slowing down and decided to not worry about it. I felt great! Mile 15-19: The fans in Queens were fantastic. That part flew by and I found myself headed onto the Queensboro Bridge. I had heard so much about this bridge, about how it’s where some people crash, and about how amazing it is once you get onto First Ave. Again I didn’t think the incline was bad, it was just SUPER long. It was quiet and I found that comforting- still no need to listen to music. The only thought that came in my head was, “Oh man I can’t wait to get back into Manhattan.” It was literally that same feeling I get on the weekends when I’m in Brooklyn trying to get back home to Manhattan- Get me out of here! I was careful running down the bridge as it was a sharp decline and my knees don’t like that. We made a sharp left and there it was, exactly what I had read about, the crowds. Six, seven people deep lining the street. We made another left turn and headed up First Ave. Around mile 18 my legs started to get tired so I walked through the water station, chugging Gatorade and water, and then I told myself I’d see mom and Carol soon and to keep running until I get to them, but I never saw them. Oops! I was too fast for them (and the trains were too slow). Then I told myself to keep running until I saw the lululemon cheer station which I thought was going to be at 125th and First Ave. Clearly I didn’t do a good job recalling where I was supposed to find people because they weren’t there either. So then I told myself to keep running to Mile 20. Mile 20-23: The fans never ceased to amaze me all day long, and they were very energetic in the Bronx. Besides Staten Island this was the one borough I’d never run through. “The Wall” for me was different than it’s ever been. It wasn’t my legs that were done, at no point did they ever feel like lead, it was more my mind. I was tired, not physically, but mentally, and not like I needed a nap, but there was SOMETHING in me recognizing how much I was exerting my body and it’s energy. So eventually my thoughts were nothing and my legs kept moving. At 128th street I finally saw my lululemon girls (and guys). And BOOM! EmP and Mik’s faces were right there. Mik was jumping up and down and dancing and I was so excited! Then this guy started running along side me. Again I was so mentally out of it, it took me a moment to realize who he was and that he works at the store uptown! I had a good laugh at myself. Seeing my friends gave me a gigantic burst of energy and before I knew it there were mom and Carol! The next time I would see them would be after I crossed the finish line. Then all it came down to was getting into Central Park. From 116th to 90th street. Unfortunately this is one long hill. Not super inclined, but long, especially knowing what’s awaiting you. I thought, “I’ve run this hill before. I can do it! Ok walk for thirty seconds, maybe twenty that’s all. The less you walk the quicker you’ll be done.” Except the thing was, I didn’t really want it to end. I had been so excited about this race for so long. I didn’t want it to end but I also didn’t want to slow down. I took a second and breathed deeply to take it all in and then I RAN. 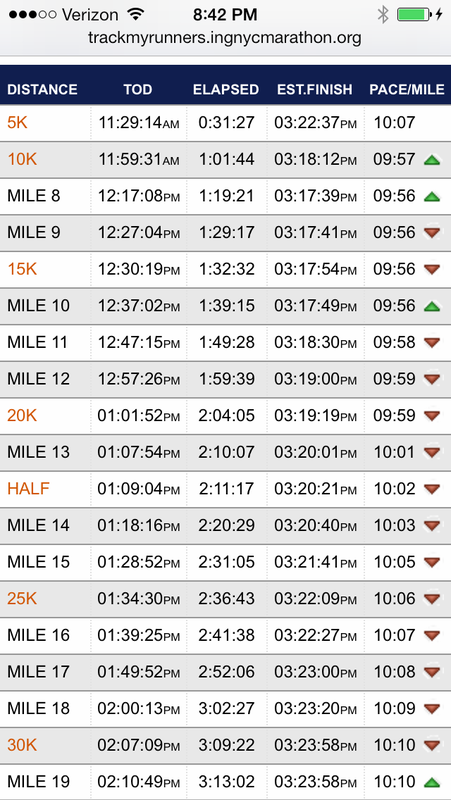 Mile 25-26.2: 1.2 miles to go. This part is really a blur but I think these details are right… I had run mile 22-25 a couple weeks ago but saved this part for race day. I told myself to Go go go! Around mile 24 I finally put in my headphones. The first song I heard was “Wrecking Ball” and “Party in the USA.” There’s nothing Miley can’t get me through! Then as soon as I was about to walk the two perfect songs came on- Soulja Boy “Crank That” (who’s now following me on twitter)! and “We Found Love.” It’s literally impossible for me to NOT run to these songs. And then as I was running down Central Park South the most wonderful thing happened-HEATHER AND JAMES! Heather had made it out of the store on time and met James just in time to see me pass. I literally jumped for joy and got that one last serious burst of energy! There’s the finish line, get up that hill! Again it’s crazy how nearly consistent I was the whole race. I could have sworn I ran that last mile in under 9 minutes, but I guess that’s just how I felt energy wise! Mile 26.2-27 (at least): I was wrapped in foil instantly and handed my medal. I wanted to cry and I felt choked up from tears and from not being able to breathe I was running so hard! I knew I was close to a PR because soon after crossing someone told me it was 3:32PM, and I really didn’t care. I DID this race and felt SO GREAT from start to finish! 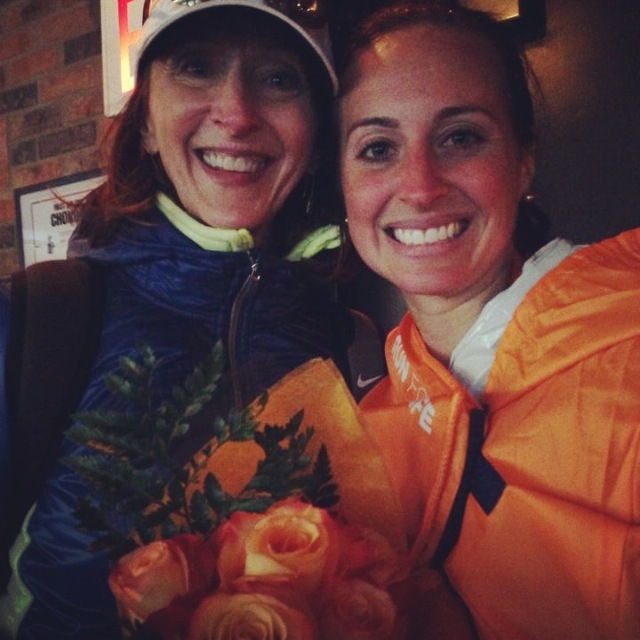 I talked to the 4:30 pacer who was like an angel. SUCH an inspiration. She kept telling me to take in the day and enjoy every minute of it. To recognize what I had done and bask in it. It was her 101st marathon. She runs 100 milers now. She also teaches private yoga classes. She was so calming and walked with me all the way until I was wrapped in the most glorious fleece lined poncho. 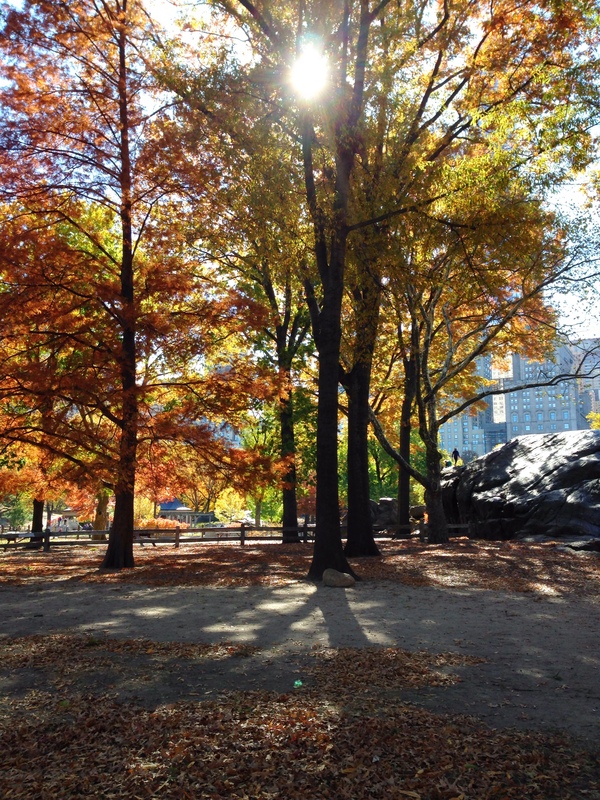 I deliriously walked down Central Park West towards 63rd street. I was so out of it I had to ask which way Broadway was. I was so excited all I wanted was to see mom and Carol! After all the details I gave mom about where to meet I wasn’t sure exactly where to go. Wandering around in my bright orange (woof I’ve had enough of that color this week! At least we beat them (Gators). Go Dawgs!) poncho I finally found the restaurant! My knees were already aching and I was greeted by my friends and mom and Carol with flowers and lots of hugs!!! I enjoyed a couple beers, chips, french fries, and a burger and then crashed. It was only 7pm but I had to go home. I lied down with ice wrapped around my knees and fought sleep until 10pm when I could no longer stay awake. I don’t know if it was because I went to bed so early or because I was so excited about the previous day but the next day I woke up at 5:45am and couldn’t go back to sleep! The one good thing about this meant beating the crowd to Clinton Street Baking Company. Banana and walnut pancakes, yes please! With bacon, syrup and a mimosa of course! From there were headed to the Finishers party back up at the park. What a crowd! It was so fun continuing to celebrate with fellow runners all we had achieved! We were all rocking our race day shirts and medals (I wore my medal yesterday too so people would know why I was walking funny). We walked across Central Park to Bloomingdales and Starbucks and spent the day shopping, enjoying each other, and walking very slowly. The park was gorgeous and it was so empowering to see the 59th street bridge and be able to think, “I crushed that thing yesterday!” After mom and Carol headed back to Atlanta I went to meet Leticia and Brittany for dinner, our third dinner together in a row! 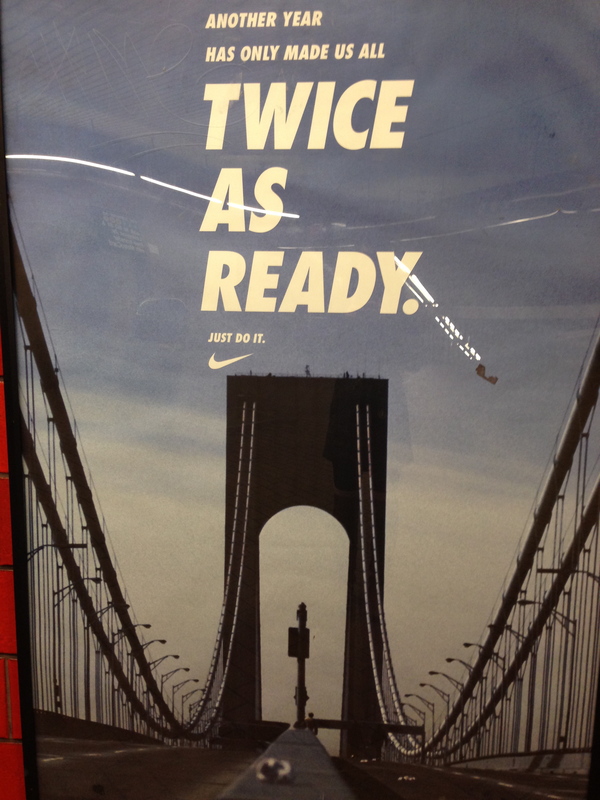 As I was very thankfully taking the escalator up to the street from the subway I saw this ad and had to take a snap. Again, to everyone who waited so long. Thank you New York. That was so awesome to read! What a great experience and weekend! You rocked it and had fun! !